**** Chosen by Winner: Kevin M.
Aaron Frederick has has crafted a practical, but elegant, full-tang fixed blade, one of his 3PS series, with a 3.5-inch clip point blade of CPM 154 CM high carbon powder metallurgy stainless steel. The handle material is Carbon Fiber with Chad Nichols stainless Damascus bolsters. A pouch style Buffalo leather sheath is provided. 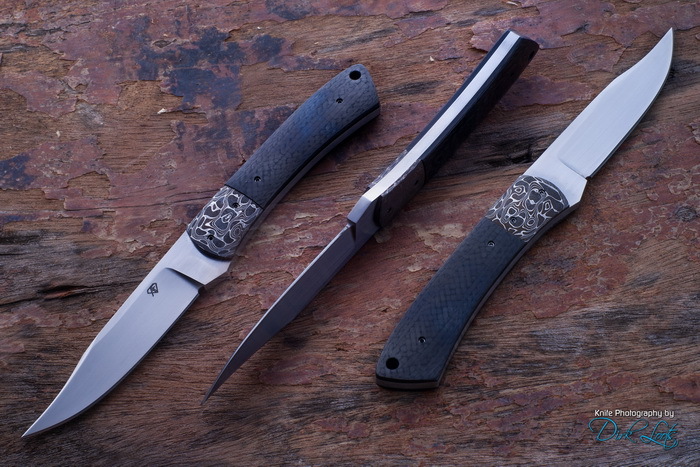 Of his 3PS models, Aaron notes, "These knives came along from trying to make a good solid knife to carry that was [tough] enough to stand up to every day life but, was dressed up like a 3 Peace Suit Businessman." I have been making knives since 1994. I have been forging my own Damascus for many years now and also use all the latest stainless steel.